This Wednesday marks the end of the first year of self employment for me. I’ve come quite a long way in that time, so I thought I’d share some pictures of where I used to work/live and where I am now. My old bedroom at my parents’ house was small. I know a lot of people think their rooms are small, but this was something else. It was 8′ by 8’6″, which is about 2.4m by 2.6m. If I’d been able to lie down on the floor, which of course there was nowhere near enough space for, I would have been able to touch all four walls at the same time. Click on the image to see a bigger version. It’s all stitched together because there was no way to hold a camera far enough back from it all to fit it in frame. I’ll talk you through it. That is my leg at centre bottom, because it was not possible to take this photo without being in it. 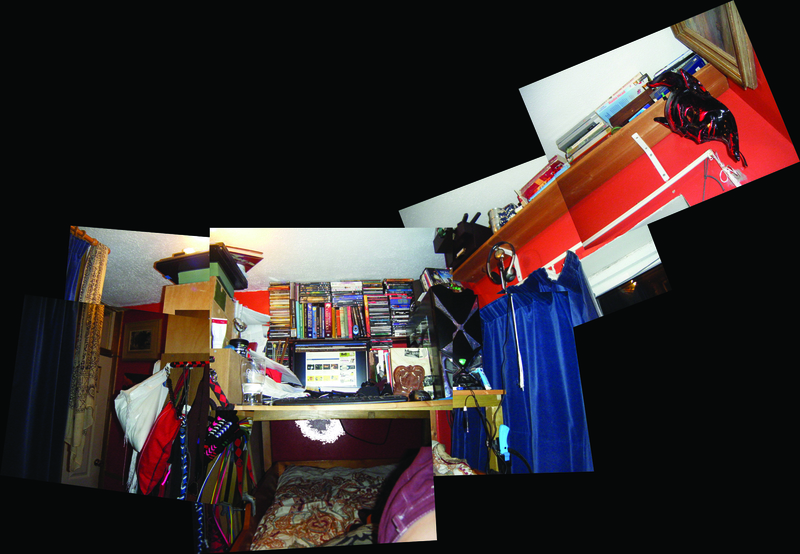 I am lying on my bed, which was about 4′ off the ground, and had my desk over it, as you can see. 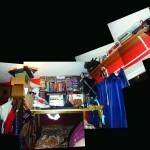 On the left of the desk, that thing with all the stuff on it is a 6′ tall bookcase. The blue velvet curtain on the far left covers the wardrobe, which is built directly above the chest of drawers. 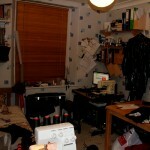 Beyond the bottom left was my sewing machine, a treadle driven singer 15k, which took up way more space than was really available, resulting in the folding work table part being fully folded out all the time because I had to fold it out and then pivot and slide it under the bed. Also under the bed were six crates of fabric, another, smaller bookcase, and a lot of yarn and miscellaneous things. If I wanted to cut fabric or draft anything, I had to do it on the kitchen table downstairs, subject to nobody else using it, or cooking, or whatever. Jump forward a year, and I’ve moved out of my parents’ house to my new room! It’s actually big enough that I didn’t need to stitch a bunch of pictures together, although, granted, I did take this with an 18mm lens. 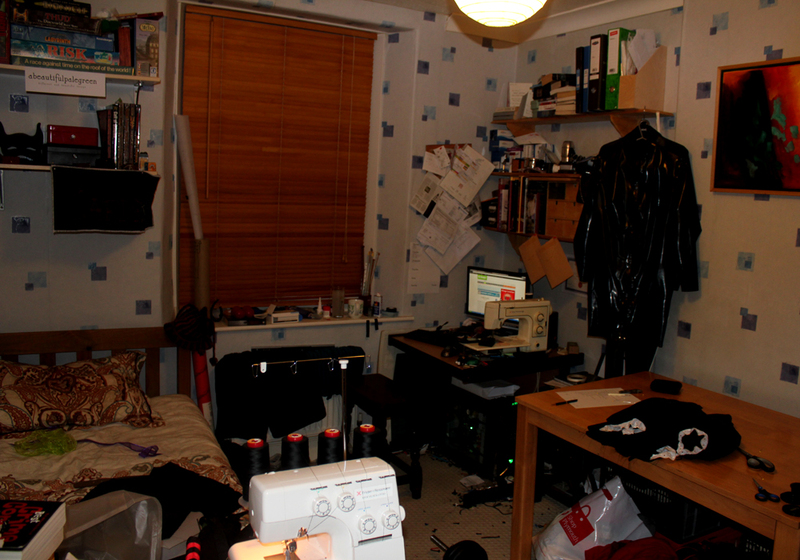 Look, I can have my sewing machine and my overlocker (both Frister+Rossman because Frister+Rossman are AWESOME) available all the time, I have my own table, a chest of drawers, which the overlocker is sitting on, and a seperate wardrobe, which is out of shot to the right. Ideally, I’d like to sleep in a hammock, so I could take it down during the day and have another table… maybe at my next place. I also wish I had exposed beams to hang stuff from, because you can get SO much more in that way. Oh, and the six crates of fabric are under the bed, and there are three more under the table. They are all full. You can also see one end of a barbell on the floor, because I have so much space that I can actually work out! So anyway, it’s been a year! At top right, you can see my very important BUSINESS files. I have these because I am a very busy BUSINESS man, who is often engaged in BUSINESS and such. It’s really no big deal. As I said in the Etsy description, I know it’s irrational, but I love this cushion. At christmas, my aunt, a reformed dressmaker herself, came to stay with my parents, and when my mother started knitting, and I started knitting, she lamented the fact that she had not brought any knitting with her. I told her that I was, very slowly, making another knitted patchwork quilt, and if she wanted to knit some pieces, that would be very much appreciated. So she began, and knitted a good number of pieces for the quilt. Recently, my mother finished her project, and didn’t have anything lined up, so offered to knit more patches. But I suggested she knit something more immediate, perhaps four equal sized patches to make into a cushion cover. Then we started talking about Harry Potter. Shortly after that, we were talking about the jumpers that they recieve every christmas from Mrs. Weasley, and I mentioned that I would like to knit something like that for Etsy, but that it would be a shame if I knitted one with an H, and then someone called Julie really wanted one. And I didn’t really have time to knit 26. Then, we hit on symbols. Symbols are tremendously important these days. It’s a generational thing. My mother, brought up before iTunes, and when CD players still had text on them, doesn’t know what that little equilateral triangle and those two vertical lines mean, but I know that it means play/pause. And then, when you think about it, there are an enormous amount of symbols in everyday like. You just have to look at any comic or cartoon where a character swears in a speech bubble to see that. A short period of frenzied creation later, we came up with the projects. 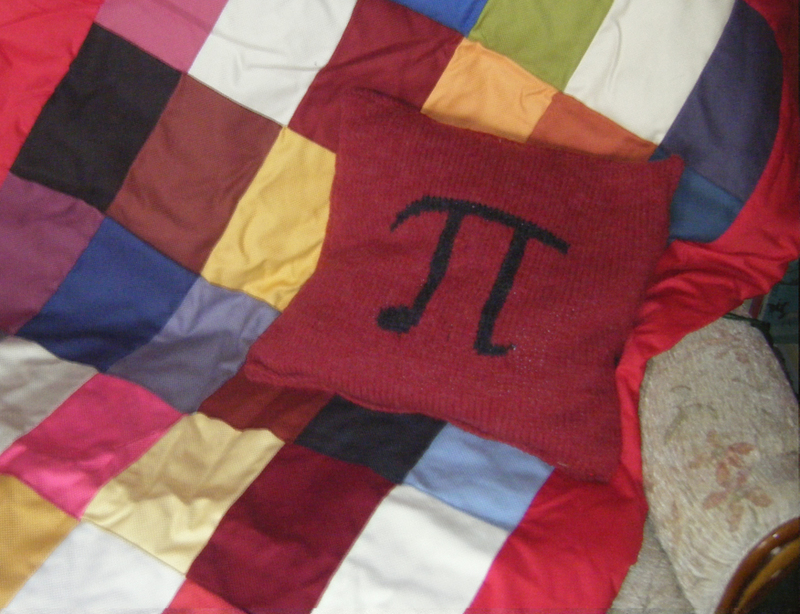 I would knit the Pi LLOW, and my mother would knit the square root of X, which, at time of writing, is still under construction, but should be available on Etsy soon! What is the square root of X? I don’t know. Perhaps it is nine. Perhaps 12. It might even be Pi.